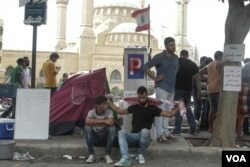 Hopes for peaceful protest demanding change in Lebanon were dashed Wednesday when scores of people were injured and many arrested, including hunger strikers. For the second week, demonstrators took to the streets in response to cross-party talks, dubbed the National Diagloue, being held in an effort to lift the country out of its political quagmire. 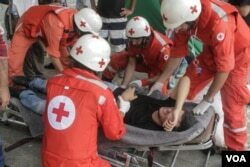 Riot police detained 38 demonstrators, with at least 20 hurt in clashes. Protesters had gathered as part of the "You Stink" movement, which brought thousands to the streets in recent weeks calling for an end to the country’s two-month trash crisis and condemning the politicians they hold responsible. They sought to disrupt a second emergency meeting of the leaders of Lebanon’s many sects and political groups, whose failure to find compromise had led to near deadlock in parliament and left the presidential post vacant for well over a year. Similar tactics were used by "You Stink" last Wednesday for the first National Dialogue, drawing thousands to Martyr’s Square in the center of Beirut. The number of demonstrators was considerably lower this time, and the day was in stark contrast to last week’s carnival-like atmosphere. It began with baton-wielding riot police, who blocked protesters from a road leading to the government buildings, dispersing crowds by force and dragging a number off. 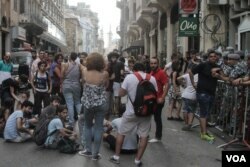 Among those arrested were three men who had been on a hunger strike for the past two weeks. Thirty-year-old Hadi Ezzdin dismissed the National Dialogue, which resulted in no solid agreement and will be held again next week. “We wanted to reach parliament, as is our democratic right. But they prevented us,” he said, before pointing to a red mark on his arm which he claimed was the result of being hit by a policeman’s baton. “This is supposed to be a democracy. I have no gun, no knife, nothing. But they want to make us afraid,” Ezzdin added. Violence also flared outside the Ministry of Environment, where hunger strikers have been holding a sit-in as part of an effort to force the resignation of environment minister Mohammad Machnouk. Their calls were part of a broader package of demands by "You Stink," including the holding of twice-postponed parliamentary elections. A group claiming allegiance with Nabih Berri, who holds the senior government role of speaker and heads up the Amal party, attacked protesters and destroyed the tents of the hunger strikers, some of whom had been detained earlier in the day. The Amal party, which is largely supported by Shia Muslims, has since denied any links with the group. 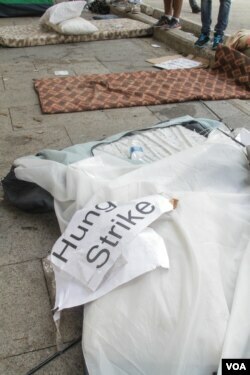 More tents have since been set up outside the Ministry of Environment, with some protesters pledging to stage a sit-in in solidarity with the hunger strikers. The violence was reminiscent of mass "You Stink" protests held last month, in which security services were roundly condemned for a show of force that left hundreds injured and included the use of tear gas, rubber bullets and water cannons. But last week’s protests saw more restrained tactics by riot police, and an agreement reached by politicians to address the crisis that has seen garbage piling up on the streets. It included an 18-month “transitional period” to include the temporary and controversial re-opening of the nearby landfill whose closure sparked the crisis, as well as redistributing rubbish from Beirut and Mount Lebanon to other parts of the country. But while some welcomed the new plan, "You Stink" organizer Wadih Al Asmar dismissed it as a “lie,” claiming there was little to bind politicians to the key long-term proposals. Since last Wednesday, "You Stink" has pledged a shift toward more direct action, with activists Tuesday attempting to storm the Finance Ministry.